Once again due to the unique way of preparing these posts in advance I have stumbled on a new problem. I still have battle reports for 5th Edition while I'm exploring new 6th Editon so I hope you don't mind having to straddle the two rule-sets to enjoy what went down. For one you've no choice and for two I'm not about to dump the content, in particular all the Warhammer World battles, not to mention an obscene 25,000 point [each side!] Armageddon battle. This was my last match with my mate Ben before 5th expired quietly in a corner somewhere. 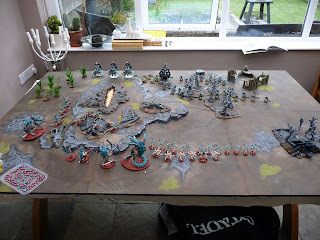 Having initially cancelled our next match my old gaming mate Ben realised to bin off 5th Edition before 6th had even come out was a little premature and was eager to pit his 'Crons against my 'Nids again. So he reinstated our planned match and I got a few pictures but not a complete turn by turn report so don't think the pictures necessarily represent the action taking place in the description. Anyway so here's turn 1 after I stole the initiative. Taking into account he has Imotekh the Stormlord which would have been DoW anyway I was hoping to make fast ground ahead of the daylight coming and my guys being open season for shooting. The Stormlords lightning took two wounds off the Trygon and 3 wounds off the Hive Guard [so 1 was dead] not good considering their my main anti-tank. Having barreled everything forward Ben did the exact opposite of what I thought he'd do, he didn't come to meet me but retreated, suddenly my Ymgarls were in completely the wrong place. Also that magma chasm suddenly became a hindrance to my movement and not Ben's. In his second turn Imotekh tried to keep the storms shoruding the battlefield in darkness but rolling a 2 meant that the clouds cleared, no more lightning and the battlefield was revealed. 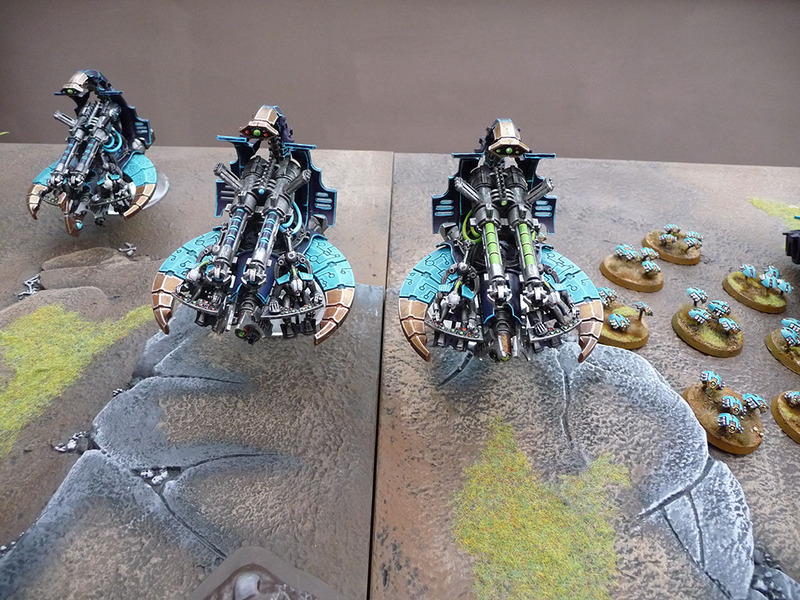 3 Annihilation Barges - these are just killers of 'nids. I managed to immobilise the one on the right quite early on thanks to the lone Hive Guard. 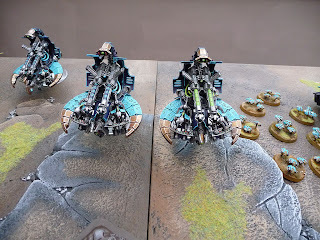 I would later immobilize the second one which allowed auto-hits from the Broodlord but the remaining barge and active weapons still plagued me throughout the game. The Tervigon managed to spawn for the entire game, and each roll was double figures in extra gaunts which with hindsight was a mistake as I was just creating more kill points for him to take down. By about turn 3 pretty much my entire force was bogged down in the Aquila wreckage. The Hive tyrant had repeatedly fired on the Ghist ark but kept on missing and taking out scarab swarms. 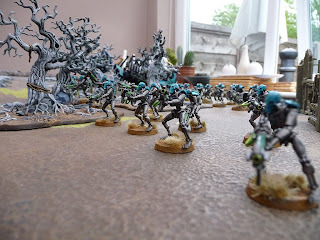 The Adrenal Stealers had gone straight to Imotekh and the Immortals - the Broodlord hypnotised the Stormlord and caused a wound, the remaining stealers ravaged the Immortals and the innability of th eunit to land telling blows meant they broke and ran allowing me to slaughter them as they tried to flee. Luckily Imotekh failed to resurrect and I consolidated into the trees. With the scarabs coming forward I threw the lead termagants at them, followed up by the couple of remaining Ymgarls and the Trygon. 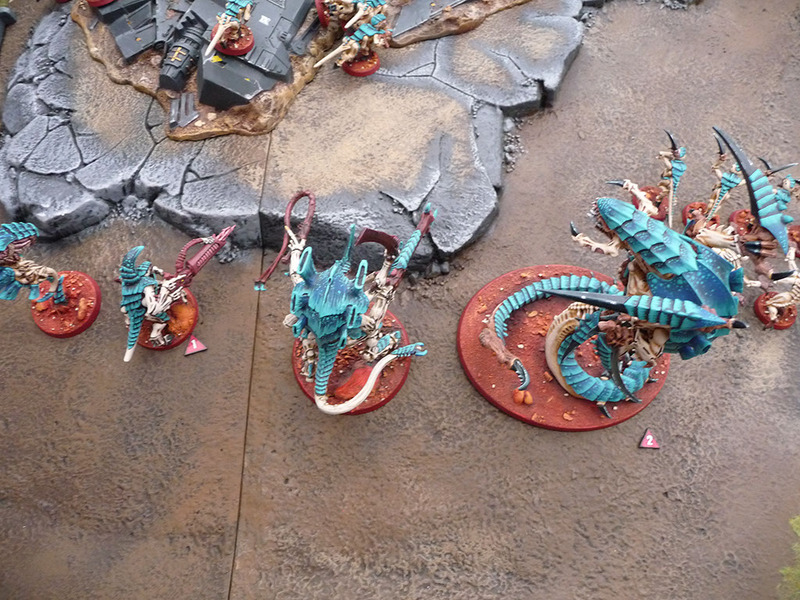 They smashed them to pieces and despite the significant losses to the 'nids [the Zoanthrope too was killed before he got to shoot!] very feew complete broods had gone. 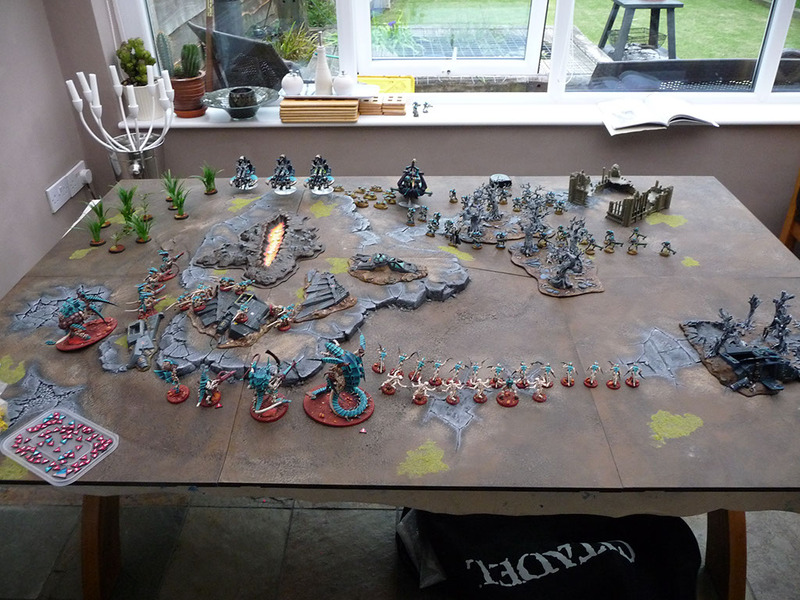 By about midway I'd managed 5 kill points to Ben's 2 but with the spore pod over on the right and out of synapse the 3 remaining Devgaunts were already routing towards the board edge and a further Necron KP. So by the end of the 4th turn the roles had reversed and Ben was on 6 KP to my 5. The Tervigon had headed towards the Annihilation Barges and had suffered 5 wounds and saved quite a few other attacks but eventually it succumbed but the psychic back wash of it's demise killed an entire brood of 11-13 termagants stood in front of it - 2 KP's for the corns with one shot! 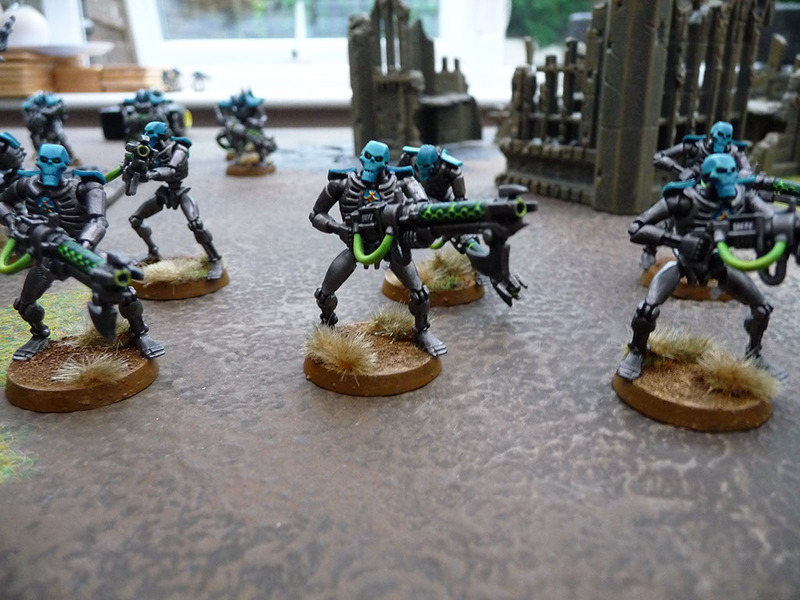 Something else eventually gave up the ghost, the warriors with Tesla Carbines may have finally took the Broodlord down who had scrabbled ineffectually at one of the immobilised Annihilation Barges leaving a sole Ymgarl to keep mutating in a hope to rend it to death. Meanwhile the Royal Court on Necron Lords had diembarked from the now wrecked Ghost Ark, their weapons casuing a lot of damage and then their mindshackle scarabs doing worse to the Tyranid Prime and the Warriors. My initial hopes for the combat after the all but one of the Warriors passed the Mind shackle test and resulting in 3 ou tof 5 lords being killed was scuppered as all three resurrected. I threw everything at them, all the Termagants bottlenecked by the magma chasm, but still quite a few got to join the mellee. The Trygon too tried to battle on but ended up stabbing itself to death. 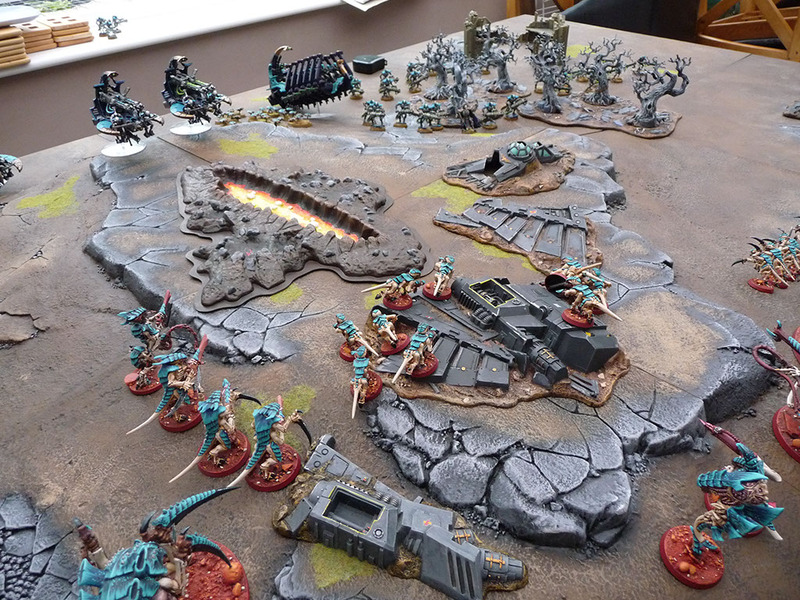 By the end of round 5 I think the Hive Tyrant and Hive Guard had also been takne down by long rang fire. With the big assault likely to end up in a wipeout for me I pointed out that there was literally no chance for me to catch up and we called it at about 12:30 am! Once again a game that teetered on the edge but it was the durability of the Crons that won out again in the end. I think I had been much more aggressive and challenging this time and I think it was one of my best games yet. A lot of my force did what it was supposed to do barring the fail with the Hormagaunts and the ineffective Zoanthrope. My deployment fails were down to the spore pod and the Ymgarls in the wrong place and also not getting the termagants into place as a shieldwall against the mindshackle scarabs. That way my Warriors could attack the Lords without fear of being taken over. Successes were the Broodlord, I dithered over Hypnotic Gaze and Aura of Despair to potentially help the Hormies - they lost anyway so I'm glad I neutered Imotekh, so much for his battle prowess! 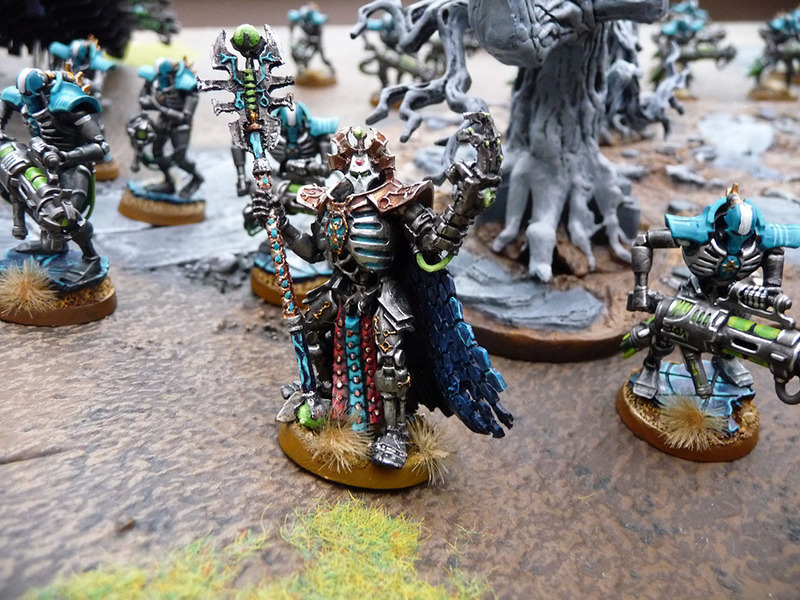 The Hive Guard also did their, or should I say 'his' job given he was on his tod for the entire game.